A pretty punch is quickly made in a pitcher for a refreshing, no-fuss drink. 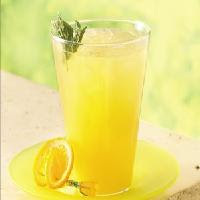 In large pitcher, mix cold water, orange juice concentrate, grapefruit juice concentrate and sparkling water. Serve spritzers over ice. Garnish each serving with orange slice and mint leaf. Calories 70 (Calories from Fat 0); Total Fat 0g (Saturated Fat 0g, Trans Fat 0g); Cholesterol 0mg; Sodium 0mg; Total Carbohydrate 17g (Dietary Fiber 0g, Sugars 14g); Protein 1g. Daily Values: Vitamin A 2%; Vitamin C 100%; Calcium 0%; Iron 0%. Exchanges: 0 Starch; 1 Other Carbohydrate; 0 Vegetable; 0 Medium-Fat Meat. Carbohydrate Choices: 1. This entry was posted on 2:35 AM and is filed under Drinks . You can follow any responses to this entry through the RSS 2.0 feed. You can leave a response, or trackback from your own site.